The growing Bay Area Express Lanes network is set to expand by another 25 miles this month with the opening of new lanes in both directions of Interstate 580 through the Tri Valley area of eastern Alameda County. But the Alameda County Transportation Commission, which is spearheading the project, needs a spate of dry weather before it can announce a firm opening date. Express Lanes are a cornerstone of MTC’s work to meet the Bay Area’s freeway congestion challenge by improving the efficiency of the region’s freeways. Like traditional high-occupancy vehicle lanes, Express Lanes are free for carpools, buses, motorcycles and other eligible vehicles. But additional capacity (if any) is available to solo drivers who choose to pay a toll to use the lane. Tolls vary based on current traffic conditions, and paid via MTC’s FasTrak® electronic toll collection system. The opening of the 580 Express Lanes will mark the first time all vehicles in a Bay Area Express Lane — including carpools, vanpools and motorcycles — will be required to have a valid FasTrak account. In preparation for the 580 opening, MTC last year began distributing new switchable FasTrak Flex® toll tags, which can be set to indicate the number of occupants in a vehicle. FasTrak Flex toll tags are required for toll-free usage of the Express Lanes by carpools, vanpools, motorcycles and eligible clean air vehicles. Solo drivers can use either a traditional FasTrak tag or a FasTrak Flex tag set to the “1” position. Carpools and vanpools with two or more occupants, as well as motorcycles and qualifying clean-air vehicles can avoid toll charges by setting the indicator to the “2” or “3+” position. The California Highway Patrol is responsible for enforcement on the 580 Express Lanes, including occupancy verification. Two eastbound Express Lanes on I-580 will extend from Pleasanton to Livermore. 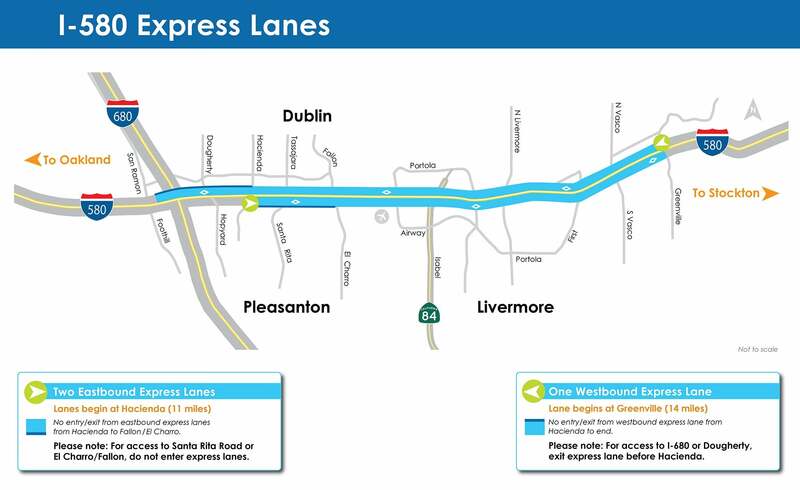 A single westbound Express Lane will stretch from Greenville Road to the San Ramon Road/Foothill Road exit. The Express Lanes will be open-access through most of the corridor, meaning motorists generally will be able to freely enter or exit the lanes at all but a few points. One of the access restrictions will require westbound motorists transitioning to Interstate 680 to exit the Express Lane before Hacienda Drive. Eastbound motorists will not be able exit the Express Lane until El Charro Road. Weekday operating hours for the 580 Express Lanes will extend from 5 a.m. to 8 p.m. In advance of Opening Day, the Alameda CTC has set a minimum toll of 30 cents per zone during periods when tolls are collected. The 580 Express Lanes include seven toll zones in the eastbound direction and eight westbound. The Alameda CTC expects maximum tolls to range from $9 to $13. MTC is working with the Alameda CTC and other agencies to develop a 550-mile Bay Area Express Lanes network slated for completion by 2035. Express Lanes already are open on 14 miles of southbound Interstate 680 from Sunol to Milipitas and on a three-mile stretch of State Route 237 in Milpitas and San Jose. MTC will convert 150 miles of existing carpool lanes to Express Lanes and add 120 miles of new lanes to close gaps in the network. The Commission began work on its first Express Lanes project last summer with the conversion of the carpool lanes on I-680 between Walnut Creek and San Ramon. The project is scheduled for completion in early 2017. Learn more about the 580 Express Lanes at www.AlamedaCTC.org/580Express. For more information about FasTrak and the new FasTrak Flex switchable toll tag, visit www.bayareafastrak.org. Click here to download and view the complete area map.